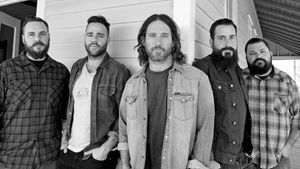 New Song: Blacklist Royals - "Hearts On Fire" off upcoming album "Die Young With Me"
My old friends, Blacklist Royals, have finally released the lead single, "Hearts On Fire," off their upcoming album "Die Young With Me." Stream the song below! "Die Young With Me" is set to be released on June 10th, and will be the follow up to their 2010 release "Semper Liberi." tags / Blacklist Royals, New Song, New Album, "Die Young With Me", "Hearts On Fire"
Midnight River Choir post acoustic performance video of "Circles"off "Fresh Air"
Midnight River Choir have posted an acoustic video of "Circles" that features a behind-the-scenes look at the making of their new album "Fresh Air" that's out today! Watch the video below. The band is set to embark on a pretty extensive tour of Texas throughout the months of March and April. Check the tour dates here. New song: Chuck Ragan - "Wake With You" off new album "Till Midnight"
During a recent stop in Cologne, Germany, Chuck Ragan (and the camaraderie) have teamed up with Lee Jeans and The Cardinal Sessions to perform a new song titled "Wake With You," the third song that has been released off his upcoming album "Till Midnight." Watch the video below. You can listen to the 2 other songs, "Something May Catch Fire," and "Non Typical" on our American Roots Playlist for the month of March. The new album is set to be released on March 25th via SideOneDummy Records in anticipation of his co-headlining US tour with The White Buffalo.